For close to a decade we opposed the competitive bidding process in home care. The competitions for service destabilized the sector and drove many health professionals to seek employment elsewhere. It raised administrative costs. The NDP called it “cutthroat bidding,” which was pretty close to the truth. Finally after a series of moratorium, Health Minister Deb Matthews quietly let it be known the process was good and dead. Ding dong. We first heard about it through a Tweet from RNAO CEO Doris Grinspun. It was later confirmed by the Ontario Association of Community Care Access Centres. It felt like a weight lifted off of us, even if the alternative the OACCAC is working on now gives us significant pause. So why was Deb Matthews so reluctant to simply come out in public and say so? When the Local Health Integration Networks were created in 2006, we saw the potential for the destructive competitive bidding model to be used in other sectors, including hospital services. When we expressed those fears, the government suggested that we were fear mongering. Fear mongering no more: On December 17 the government quietly unveiled plans to do just that. Beginning next year the Local Health Integration Networks will be accepting bids to establish non-profit specialty clinics that will conduct such traditional hospital procedures as cataracts, dialysis, colonoscopies, endoscopies, outpatient minor orthopaedic procedures and diagnostic services. Funding will be from the pool of money hospitals have been relying upon in the wake of a base funding freeze. The procedures will be invoiced through OHIP. It will place hospitals in competition with private clinics. Where such bids will come from will be interesting given the overwhelming majority of existing independent health facilities are for-profit. Hospitals will also be able to get in on the bidding process. No doubt the government knew this was going to be controversial. Why else would they make such a major announcement a week before Christmas and just after the legislature recessed for the holidays? By the time the opposition gets to ask questions the bidding will have begun. The government has repeatedly claimed that these procedures can be done just as effectively in the community for less cost. We have yet to see any evidence to back this up beyond the usual cherry-picked examples. Nor have we seen any analysis of what this will mean for hospitals already struggling to meet the mandatory requirement to balance their budgets. How much input will communities have in the running of these clinics? Will these non-profits be required to post on-line financial information or quality indicators? Will they be able to evade disclosure on the sunshine list as has the VON and St. Elizabeth Healthcare leadership? When the government changed the regulations this fall to place the independent health facilities under the LHINs, we knew something like this was coming. 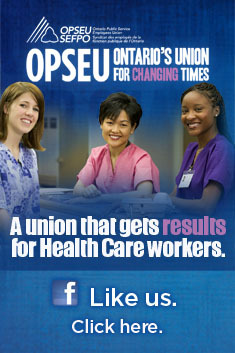 The government did listen to some of the concerns raised by labour and the Ontario Health Coalition. The clinics must provide proof they are non-profit, they have to disclose “optional fees” to patients, and they have to consult and “align” with the local hospital, ensuring they are not poaching physicians needed by hospitals to maintain medical and emergency coverage. It is ironic at a time when hospitals are undertaking expensive mergers with the blessing of the Health Minister that the Ministry should be also fragmenting services in this manner. Stay tuned — we’ll be providing further analysis of this in the new year.